A validated times series of PIOMAS-derived ice volume may serve as a proxy for validating global climate models which are used for projecting the effect of changes in green house gases. Comparison of PIOMAS-derived arctic ice volume and extent in September with the NCAR CCSM3. Ice volume and extent anomalies are expressed as a percentage of the 1958-1978 mean. NCAR CCSM3 runs are the IPCC 20th century run concatenated with the corresponding A1B scenario, and the pre-industrial control runs. Shaded areas indicate the standard deviation of the 5-member ensembles. Because the current version of PIOMAS begins in 1979, an earlier version that only assimilates ice concentration is used here. The figure shows that ice volume anomalies depart from the control run earlier than the ice extent. Except for recent years (past 2007) both ice volume and ice extent anomalies stay mostly within the envelope of the 20th century/a1b scenario runs. 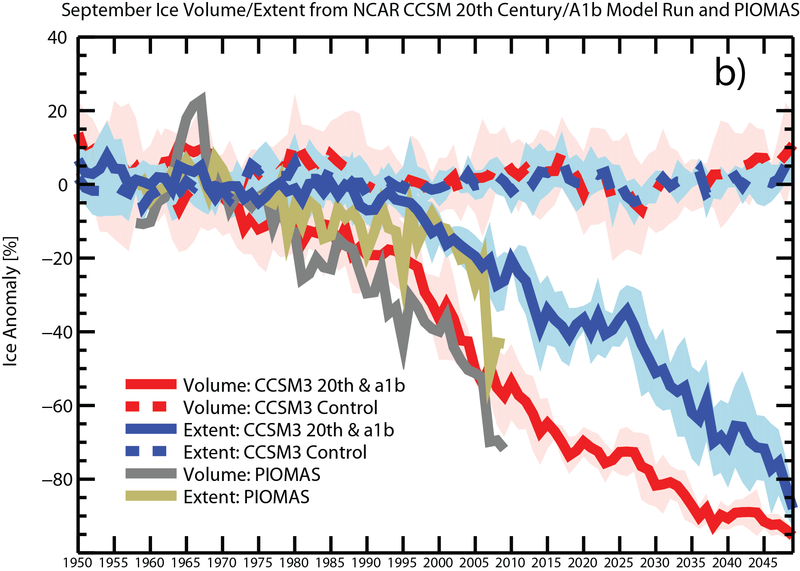 Distribution of 32-year trends in ice volume in the CCSM3 500 year control run (blue bars). Trends from PIOMAS along with error bounds [± 103 km3/decade] are plotted (grey dot and error bars). 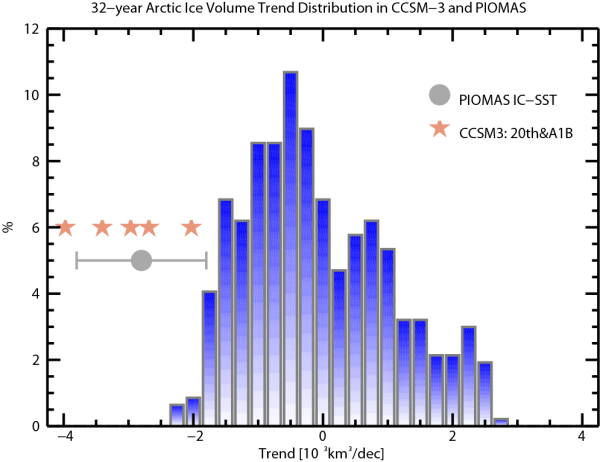 Also trends from the 20th Century/A1b ensemble are shown (stars). Using the -2.8 103 km3/decade trend from PIOMAS we find a negligible likelihood for a trend of this magnitude or greater to occur in the the pre-industrial control run. Applying our uncertainty estimates yields a 0.01% probability for such a trend of this magnitude to occur in the pre-industrial control run. If we assume that the pre-industrial control run represents the natural variability of sea ice in the climate system appropriately, then we can conclude that the attribution of sea ice volume to anthropogenic change is not sensitive to the error in our sea ice volume trend estimates.